4 Zimmer Typ Haussmann 95 m², sehr hell (7 Balkone + 2 Fenster), 3. 30 m Decke, 3. Stock (kein Aufzug), großer und sehr angenehmer Aufenthalt, 2 Schlafzimmer, 1 Büro (in einer Reihe mit einem Schlafzimmer), Küche, Duschraum, WC-WC, gratis WIFI. Straße ohne Bar oder Nachtleben. - Ein Doppelbett im Büro des Schlafcouch (Breite 140 cm). - Ein Doppelbett im Schlafcouch im Wohnzimmer, hinter einem Schirm für die Privatsphäre (Breite 140 cm). Vollgeräte: Glaskeramikherd, Mikrowelle, Herd, Kühlschrank, Gefrierschrank, Waschmaschine, Geschirrspüler, Kaffeemaschine, Toaster. Wir haben 10 schöne Tage in der typisch französischen Wohnung verbracht. Das einzig Störende sind die Müllabfuhr und die Straßenreinigung mitten in der Nacht oder am frühen Morgen, aber das kann kein Vermieter ändern. Die Wohnung ist schon etwas abgewohnt, aber wir haben uns wohlgefühlt. Alles hat, so wie versprochen, geklappt. Und Montpellier ist eine tolle Stadt mit viel Kultur, schönen Läden und das Meer ist nah. My family and I spent a very enjoyable few days in September in this delightful apartment in Montpelier. The city itself is wonderful and many of the attractions to visit are right in the centre, within a two minute walk of the apartment. 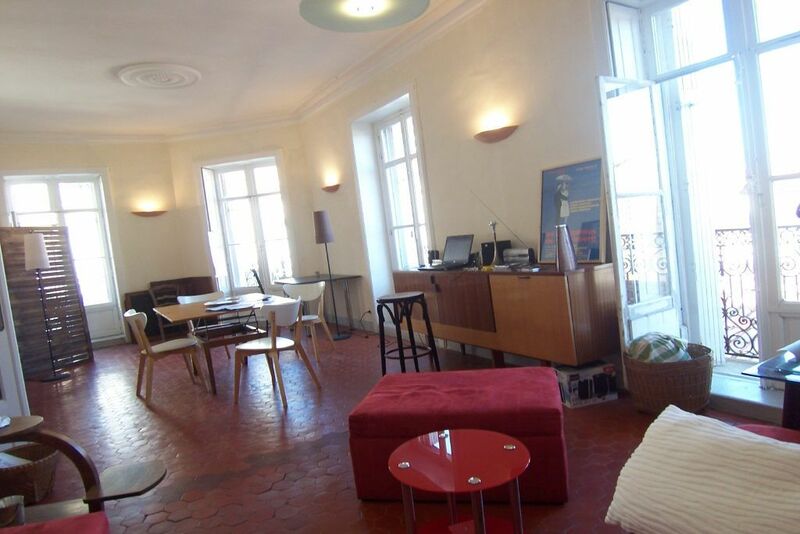 The location in the rue Baudin is quiet and very convenient. The apartment is spacious and very well furnished and equipped. Everything a visitor could need is provided and, in our case, we were given the keys, taken into the flat, and given much information, by a helpful friend of the owner.. I can highly recommend this apartment for anyone visiting Montpellier, and I would certainly make another booking there in the future. Clean, big, bright and airy and perfectly positioned for the centre of the city. We had a lovely stay in Montpellier. The apartment was superb and could not be bettered. Thank you very much Richard for your look on the apartment which encourages us a lot. See you soon, I hope. Friendship to your loved ones. Un apartamento muy grande, agradable, céntrico (a 50 metros de la Place de la Comédie), limpio, con parking... perfecto para pasar una estancia agradable en Montpellier. 150 Meter vom Place de la Comédie. Straße ohne Handel oder Nachtleben.